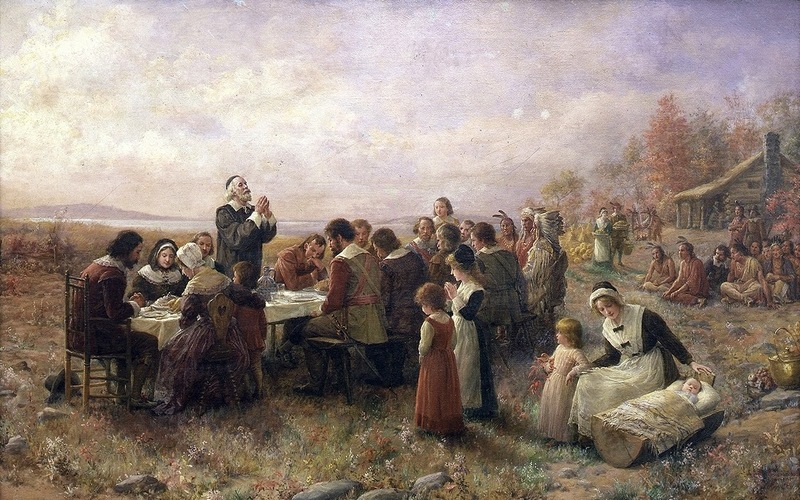 Giving thanks in the 1600s. I like to look at Thanksgiving and be grateful to the Lord for all He gives us. A lot of my fellow Americans, including my family in Michigan, are having a world of snow dumped on them right now, making life difficult and in some cases dangerous. Buffalo looks set to record more snow in a three day span than it usually gets for the whole year. Some stuff is no joke. pre-Benjamin Franklin (electricity) for a little bit. There'll be more of them in the coming months because it's Brisbane. 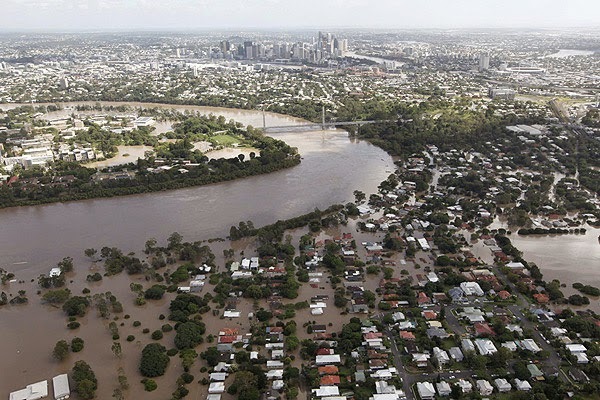 Three years ago the city - the actual city center of Brisbane - was flooded, as were many suburbs along the river. Most of the state was a declared disaster zone because of the rain and ten people died. This is not meant to be a depressing post, though! This is meant to be uplifting. Please let me explain why. In 1621, when their labors were rewarded with a bountiful harvest after a year of sickness and scarcity, the Pilgrims gave thanks to God and celebrated His bounty in the Harvest Home tradition with feasting and sport (recreation). To these people of strong Christian faith, this was not merely a revel; it was also a joyous outpouring of gratitude. This is certainly the proper attitude for we Christians! It's hard, very very hard to be thankful these days. Maybe it always was, but I think we've been conditioned to expect things, to expect good, to expect success. We often do more complaining than we need to. Being thankful sometimes seems not in our western genes. But we do have so much to be thankful for! Firstly, that we can indeed give thanks to a Lord who came down from Heaven for the purposes of dying for our sins, so that we can be redeemed and spend eternity with Him. Just acknowledging that Jesus cared and loved enough to be among us and then be crucified by His own creation. And, then who rose again after three days. Christ, the King. There are also other, worldly things to be thankful for. If you serve a turkey this Thanksgiving, know that there are families in India who think you are unbelievably rich. If you go to church on or around Thanksgiving, know that you can likely worship in safety, which was not the experience recently, of four Israelis in Jerusalem. If you celebrate with relatives, know that there are those who are alone and long for the love you share with your family. And if the weather is nice for you, give ye thanks to the Lord, and forget not your brothers and sisters upon whose house the snow doth fall. Joseph the carpenter, and his hammer. Last year, I made a Christmas Nativity set which was stuffed (here). My husband really liked it and kept commenting how wonderful he thought it was. This year, with his encouragement I created a complete Jesse Tree Ornament set, themed around the personalities related to the Scripture I use! For example, instead of an ornament that looks like a coat of many colors, to depict Joseph (ref. Genesis 37:1-36), I made Joseph himself, wearing a coat. Abraham, with the ram the Lord provided. I thought that by depicting the personalities - the Bible characters - involved in the Scriptures, it might help bring the stories and narratives to life in a unique way. I wanted it to be a fun, durable set, fun to hold and touch, especially for children; even after Christmas is over. Like one of my normal Jesse Tree Ornament sets, there are 25 ornaments in total. The set took more than a month to construct, as I put it together in my spare time. The ornaments are roughly two inches tall, and are a multicolored spectrum of funness, made of felt and stuffed with fluff, with a nice blanket stitch finish. I tried to work in the iconography of the Scripture reference as much as possible, so that at a glance the ornament would be obvious - for example, Jonah holding a big fish. Ruth, holding a sheaf of wheat. It's soon to be listed in my Etsy shop. I am currently thinking of other fun ways to represent the Scripture references in a Jesse Tree Ornament set! I'll be looking to apply new ideas for 2015. In the meantime, I have plenty of other sets available! Click here to see the different varieties that I sell! My Advent calendar for sale here. Don't panic but there are only six more Fridays before Christmas! Wasn't it just the Fourth of July? The beginning of Fall? (Or here in Australia, Spring?) Wasn't it just Halloween? (Here in Australia, they don't celebrate Halloween much). And now, Thanksgiving is almost upon us (here in Australia, they don't celebrate Thanksgiving. But I don't care...my husband and I do). There are tons of Advent calendars around: most of them are filled with chocolate, which is always fun. There is a preponderance of handcrafted ones also, available in chain stores, department stores and little homewares shops that I like to visit in our local mall. Painted wooden constructions with little tiny doors with even tinier handles, and each door has a carefully painted number on it. There was a chocolate Where's Waldo calendar which may have driven me mad if I had bought it. I think I would have just cut into it rather than deal with the frustration! I had been wanting to create my own Advent calendar for my shop since last year; I had a customer who asked for one in the middle of preparation for Advent, but being in the thick of things last year, I simply didn't have time. Fast forward twelve months, and I finally got one done. It was a ton of work but I think it came out quite well! Each ornament has its own numbered pocket, and each ornament has velcro sewn on to the back, to attach to the felt Jesse Tree, which is surrounded by a red border. Each day you take an ornament and stick it on to your tree, and watch as it grows more colorful and full, until Christmas day! 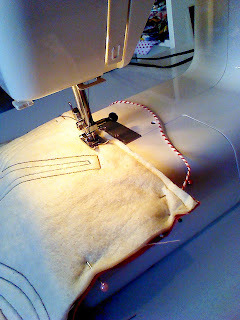 The calendar itself is mostly machine-sewn, whereas the ornaments are hand-sewn and are the same as in my regular set. I made the calendar itself with cotton (front and back), with batting between for texture. It has cotton for the pockets with felt numbers. Stitching velcro on the ornaments. I've posted already about how I believe that Jesse Tree ornaments are the perfect way to place Christ in Christmas celebrations, which for many have become commercialised and generally busy and stressful. You can definitely place your Jesse Tree ornaments on your Christmas Tree or your own Jesse Tree - we just have a bundle of skinny tree branches waiting to be adorned December 1st! - but a calendar adds a kind of permanence, a consistency that you can come back to year after year. Anyway, the calendar came out really well - it looks very homey and traditional...and will be a perfect accessory to someone's Christmas countdown! The calendar sells for USD$130 (including shipping) and can be purchased here. That, to the right, is our first Jesse Tree. We set it up with just a few ornaments on it and took a picture to see how it would look for posterity. Since we had never done one before, we wanted to make sure we had the right sort of branch. Did it have the right aesthetic? Were the branches sticking out the right way? That sort of thing. What is Advent? Its literal meaning relates to the first coming of the Lord Jesus Christ, but also acknowledges His eventual return. In the Christian cultural context though, we celebrate it as a sort of countdown to Christmas. Advent has penetrated the mainstream culture through Advent calendars of many sorts, but its original intent has always focused on the Lord. The Spirit of knowledge and of the fear of the Lord." This is a direct reference to Jesus, who would be born almost a thousand years after Jesse's son (King) David passed away. The tree stump, the first ornament in a twenty-five day activity. And, this is why our Jesse Tree ornament set begins with a tree stump. The ornaments are a way of tracing the people, places and stories in the Bible that are the most noteworthy and/or iconic; small stepping stones which relate the narrative in God's Word, culminating in the birth of his Son. "I bring you good news that will cause great joy for all the people. Today in the town of David a Savior has been born to you; he is the Messiah, the Lord." Welcome to our blog! This will be an outlet for me to talk about everything craft-related, that I do for my shop (also called Pink Scissors Design). I'll try to post tutorials, discuss what I'm working on and infuse it with a little on being an American girl in Australia. 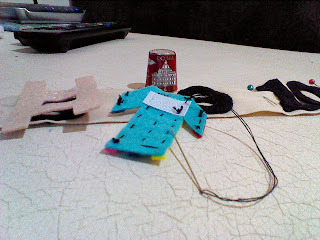 I hope you get as much joy from reading as I do from making! Please feel free to drop me a line Here and I'll try to get back to you as soon as possible. Alternatively, my Twitter and Facebook links are just up there on my navbar. My shop is readying for Advent and Jesse Tree Ornaments and can be found Here.